Moonlight through the plum tree. A deep night in March. I sigh with pleasure, with a sense of coming home. There are times in which all is well, in which everything narrows to just a moment. Here. Now. The musky scent of plum blossom. The gentle drift of petals. A sky so deep, so dark, that the waxing moon slams my senses, a pure blast of light. And nothing else matters. The world could turn on this pivot of white blossoms, white moon, and all would be well forever. The plum tree I watched the moonlight through is the largest and oldest plum I’ve known. My arms cannot stretch around her trunk. She has been slashed and cut in years gone by. Half her branches seem dead, but are threaded with moss & lichen & the small nests of hummingbirds. Each year she bears small sour-sweet red plums with yellow flesh. Each year she seeds out dozens of infant plum trees. And each year, in late winter, she dances in a froth of white. Blue jays nest at her top. Smudgie, the newest, shyest of my cats, used the tree for refuge and concealment all through the autumn, considering if I was worthy of her trust. I suppose my other cats, who climbed to sit with her,much to the consternation of the jays, gave me good references. Or perhaps it was the ever brimming bowl of food. Once this end of my little town was a plum orchard. Trees for blocks & blocks, summer gatherings to dry the plums and ship them off to…well, probably San Francisco. I figure this tree, scarred and surviving, wreathed with ivy and crowned by cats and birds, was one of those original plums. That would make her about a hundred years old. Her roots reach the heart of a hidden creek that now runs mostly beneath cement and asphalt on its way to the gentle bend of the river. A hundred years. It isn’t quite so long as it seemed to me in my 20’s, now that I am well past the half century mark myself. But it is long, and sometimes in the summer, gathering the little plums, I feel a connection to long ago people and long ago stories. 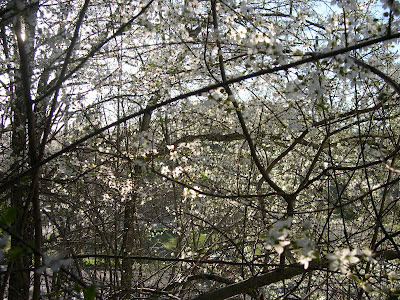 It’s too early for the blooming of plums in places like Iran or Afghanistan or in other countries, all around the world, distant, threatened countries. But I feel a kinship there as well. There is something….how can I put it…something very ancient about looking at the night sky through the branches of a tree. Round here we are enclosed in an older world still than that of my old plum. It is a world held by trees and memories, and the memories are long ones. The forests that stretch through this region, the untamed coastline…these are part of a series of chosen, world recognized treasures. Heritage sites. Places where we learn our hearts and our past and perhaps can stand at the pivot of a moment. UNESCO has a list of these places, and I discovered—it should not have surprised me—that our forests are on that list, along with archeological wonders and Neolithic sites and places of grave magic. I was reading about this particular treasure site—the forests of the Redwood Empire, the coastal corners—and came across mention (along with lists of animals and plants and birds that are cozied here, as no where else on the planet)…of human traces. Cultural sites. My plum tree is a hundred years old, a grand lady, and I honor her age. These other sites…the people there left their traces almost 5000 years ago. I sit with that thought sometimes. How many generations back would that be? Allowing, say, 30 years for each generation…17, 18? I know my own line back…back to my great grandmother, who lived and died in Finland. And on my father’s side to some mysterious people wandering from Bavaria, from a region soft with vines and flowers, where probably plum trees bloom. Though I also know my own genetic line, my maternal DNA, which goes back apparently over thousands and thousands of years to somewhere in east Africa, to a woman who bore a daughter who survived, who bore a daughter who grew up, who bore a daughter…and so on. 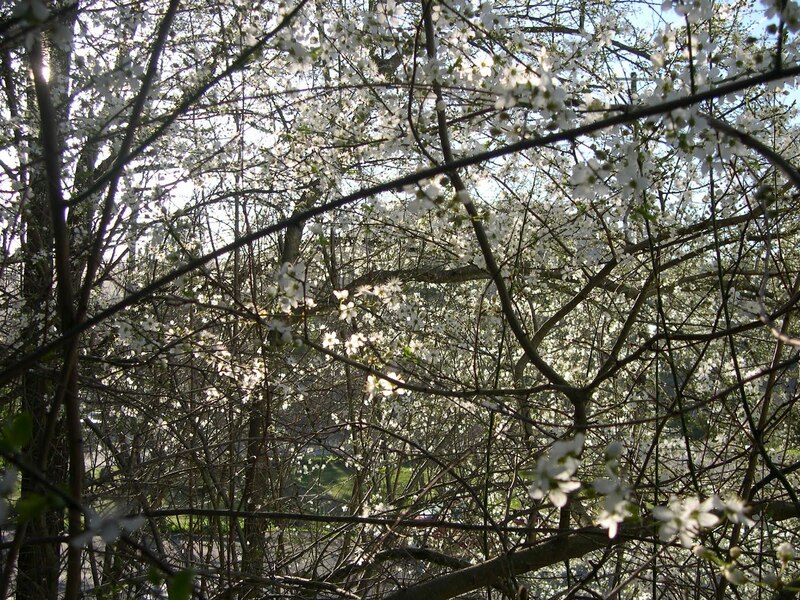 The chances that led me to my moment beneath the blossoming plum tree…are rare, amazing, impossible. And so perhaps are the chances that led to the survival of the plum tree, and the fragile survival of the beautiful forests, the redwoods who network, root system to root system, growing, standing, being home to birds and small animals, shelter to bats, rain catchers, shade, inspiration. Yeah, I know. I was caught in the plum blossom and moonlight for a moment, present only in the present moment for…far too short a time. My mind can’t help ranging. Past, future. So much is looming before us. I take strength from the power of bloom and root and endurance. From the apparently frail drifting petals, from the duff gently building at the roots of the redwoods.